This epic struggle features the lands coming alive to help out, and with it comes the favored full art lands in every pack. As if that wasn’t enough, there are super rare lands that aren’t actually from the set, the Expedition lands. These lands are special full art versions of the Fetch and Shock lands. If you happen to be lucky enough to pull one of these super rare beauties, make sure to sleeve it and keep it safe. It looks like they will be selling for between $100-300 each, depending on which one. ONE VERY IMPORTANT NOTE: One of the big rules of the store at D20 is treating each other honestly and fairly. I’m super proud of how people treat each other here, so I just want to remind people of something that will have almost everybody shaking their head in agreement: We treat trading unfairly with someone as the same as stealing. If you know that someone has a card that is worth a lot, trade with them the way that you would want to be traded with. Honesty is doing the right thing when you probably won’t get caught and it is just you who make sure you are a stand-up guy. So (and this is to our jr. members especially), remember that if you aren’t sure, you never have to make a trade. And if we find out that there have been serious “take advantage of” type trades, it is not ok.
Open at midnight Thursday Oct 1st to pick up booster boxes and fat packs. 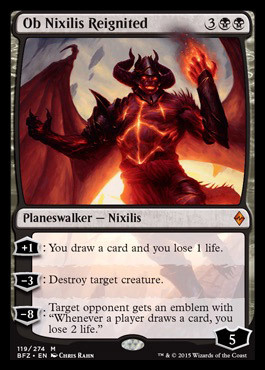 One of the all time great sets, Zendikar is back with a (for) vengeance. The invading Eldrazi…the crew of supersized god-like bad guys that gave us such cards as the all-time king of “Oh…you didn’t just cast….”, Emerkul! And this is a land known for, well, Lands. Ye p, the Zendikar lands are back! (“Why yes, I did first pick a foil basic land from this pack”) Not only are these full-art beauties are a must for any well dressed deck, but the return of the Landfall mechanic means that just playing a land can do anything from buffing up one of your guys to having another pop out an extra 5/5 creature! The Great AC fundraiser….We get cool! For those of you who have been to the new store, you know it is great, but has one big flaw….in the immortal words of Kiss Me Kate….It gets Too Darn Hot. We are looking to be both green and cool blue by putting in solar power on the roof to get the temp to stay as cool as our players. So, since running a game store is more of a public service then a fountain of excess cash, we are reaching out to our community to raise what we need to get this problem fixed for all of us. First thing we are doing is we have a real (and soon virtual) donation jar in the store. Were giving people tickets to thank them for their donations, and I’m going to kick in some good stuff based on how much we raise. The drawing to give away the goodies will be Aug 23rd (Ben’s Birthday). Here is a partial list of what we will contributed to the thank you gift drawing. $1-1 ticket, $5-6 tickets, $10-15 tickets, $20-35 tickets, and $50 or above will get you double tickets. Amount Raised Item(s) Added Met? Pokemon Charizard EX Box YES! Family Games for Firefighters: Play a game with yer family and help bring some fun to our firefighters. We all know that being a firefighter is hours of waiting around interrupted by intense, sometimes life-risking actions. We want to give some of our favorite games to our firefighters, to reward both family play and the boys and girls in red, we will set aside 10% of each tabletop game sold this weekend to use to give goodies to our firefighters. Love Letter—the most interesting card game you’ll ever play with a hand size of 1 and only 15 cards in a deck. Boss Monster-Get rid of all the pesky heroes that keep trying to invade your Dungeon. JUST Released this month– Boss Monster 2! Castle Panic: Keep the monsters from knocking down your castle…great for families (siblings). New expansion just came out: The Dark Titan. Forbidden Island and Desert: Complete the quest before the Island sinks from under you or you get buried under the dunes. Pandemic. Keep the world safe and healthy. (a lot less creepy then it sounds…even my 11 year old daughter loves it.) New expansion here as well: State of Emergency. Xenoshyft: Starship Troopers-style deck-building game where you and your space marine buddies try and keep the hoards of increasingly bad-___ aliens from overrunning your base. And in honor of our Firefighers— Flashpoint, the co-op game of keeping the day from going up in smoke. And finally: Just plain great games. Betrayal at the house on the Hill: Just scary enough game where you and your friends explore(and create) the creepy house until one of you suddenly is chosen by the game as the Betrayer, and it becomes them vs. everybody else in the game to complete a secret mission. WAY fun. Five Tribes: New game…Mancala meets 7 wonders meets Settlers of Catan. On of those games that gets better each time you play it. Info for Pokemon Prerelease and Earlier time for Date Night Magic…. Pokemon Roaring Skies Prerelease event is this Saturday morning May 2nd. Here’s the deal. We provide the space, but it is run by the Pokemon league folks, and as much as they would like to, they can not do preregistration for the event. They’ve been allocated stuff for about 26 players. so it will be first come, first served, with registration starting at 10:30 am. It is $30 (cash directly paid to the organizers). Each player gets 6 packs of the new stuff to make their best decks with, plays a few rounds, and gets two more bonus packs when they return their land at the end. We WILL be doing our version of this event for the release the next week, so if you can’t make it, don’t want to risk not getting in, or don’t make it before they sell out, you CAN sign up in advance for the RELEASE event the week of the 9th (I started doing this for every new set after the first time when I had to watch a small parade of teary eyed kids…the Dad in me couldn’t take it). It will be a full house, so kids should either have parents around or be comfortable with that type of scene (as should you). Make sure they have a box or ideally small bag to keep their stuff in…with name on it. Every time we have kids leave a pile of good cards on a table and get very upset when someone else picks them up. This is for the Release event on the 9th….NOT FOR THE PRERLEASE on the 2nd. So here is the dealeo with Events for the Khans Release weekend for Khans. Thursday at OPEN at Midnight to buy first boxes (12:01 actually…since the release is Friday Sept. 26th. We will open at ~10 pm for a little pre-midnight Zombie Conspiracy. Release day: Boxes ($119.99, Boosters 3.99 per pack, buy 6 get one free), Intros decks ($15.99-17.99), and Fatpacks ($39.99-one bonus pack) . 7 p.m. Friday Night Magic. Tonight (Thursday. Aug 21st) we are having our first Star Realms tournament. This is a GREAT deck-building game that we finally got back in stock. 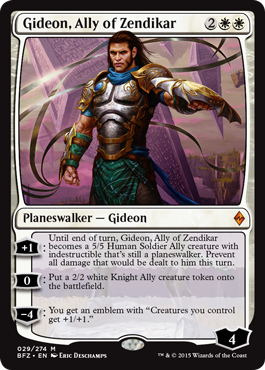 And on Sunday, we are having a Qualifier for the Salt Lake City Magic Grand Prix. Even if you don’t have any way to go, the qualifier is very interesting to try. If you’ve every wanted to see what it is like to play in a competitive tournament, this is a good one. 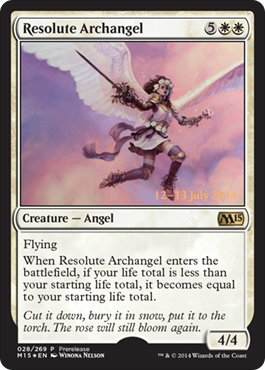 It is an M15 Sealed-deck event, which means that everyone has an equal chance in terms of the cards they get. Competitive means that it includes things like opening and marking the contents of each set of six packs and then passing them around, dosie-do style so it ends up in another players hands. Decks must be made and registered (returned to the same starting state before each match, and the rules are enforced at competitive level (no, take backs, or “I actually meant to…” and playing to slowly can be called against you if the judge thinks that it is too much. This not an appropriate event for new players, but if you know how to play and want to play like the big boys (and girls) do…this is a great event. Start time is 10 am on Sunday, Aug 24th. Besides the Magic Game Day Events on Saturday and Sunday, we have one of our special rare pack drafts (Ice Age Draft…) on Sat night, a Cardfight Vanguard prerelease for Divas Duet on Sunday at 2, and some early releases, or limited releases on some very, very good stuff. D&D Next Players Handbook ($50 for a limited number–we get to sell ’em two weeks before the general release on the 19th. Star Realms (a terrific two player deck-building game) has been in extremely high demand and we’ve been waiting and waiting for it to get in…apparently it is starting to hit the distributors and should be in early next week. Hey folks…Happy 4th of July weekend!! We’re going to be open and do some special things to have some fun for the holiday. 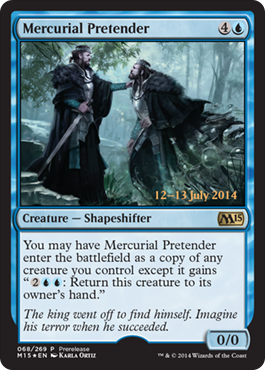 NEXT WEEKEND…M15 prerelease!!! Sign ups are ready now. Preorder boxes for $99 until the end of the 4th of July weekend…110 after that for the next week. Friday…Open a bit late (4 pm) and then we’ll be doing FNM a bit differently so people can go see the fireworks if they want to. Instead of our usual one big draft, we’re going to be doing pods of 8 starting at 4:30 with two that will be the “Official” FNM prize card times. Sign up sheets starting at 4:30…run pods when we get to 8. 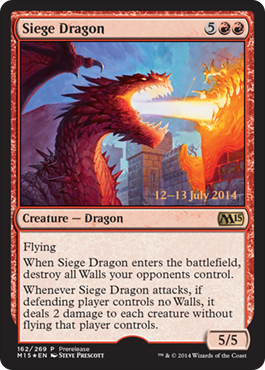 Pokemon league IS on from 11-1 on Saturday (NO POKEMON League next week because of big Magic M15 prerelease. Date Night Magic is ON for this Saturday night. 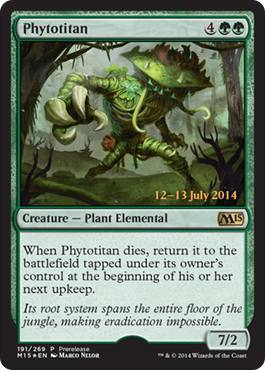 As usual we are running 4 `prerelease events, two on Saturday and Two on Sunday. Each of 5 different color prerelease pack comes with 5 M15 boosters and 1 special seeded pack of it’s color, as well as a special promo card that can be used in the deck.